ATEN has specialized in connectivity and management solutions in information technology, professional audio/video and green energy business since its establishment in 1979, and has been a worldwide leader in the KVM switch market. ATEN offers a broad range of solutions to meet the needs of consumers, small office/home office (SOHO) users, and small and medium sized business (SMB) customers. ATEN´s state-of-the-art KVM switches include Cable KVM, Desktop KVM, Rack KVM and KVM Extenders. ATEN also offers LCD KVM switches to meet the needs of server rooms in tandem with the ALTUSEN™ line of high-end server management solutions for the enterprise-level KVM switch market. Furthermore, ATEN´s Over the NET™ solutions allow you to effectively manage IT infrastructure from anywhere in the world. ATEN also offers the VanCryst™ range of video integrated solutions for a wide variety of corporate, commercial, and home theater applications. Our high-quality audio/video switches, splitters, extenders, and converters are available with various audio, video and control interfaces. At ATEN, we are committed to protecting the environment. To this end, ATEN NRGence™ line is the latest evolution of energy intelligence. A green energy solution for data centers that provides instant real-time power management control and energy-saving efficiency, by allowing you to easily upgrade your current IT resources quickly and cost-effectively. ATEN delivers and we make customer care a priority. We are committed to providing the best customer support available in the industry. I have a Dell DMPU2016 KVM and I'm not able to find what dongles I would use to connect to the servers. Just need the RJ45 to USB/VGA dongle part #. I was told this is just a rebranded Avocent KVM but I don't know which one. But are these dongles product specific or can I use 3rd party? I need an inexpensive KVM that supports three (3) display ports. I can't seem to find anything under $100 that supports the DisplayPort (dp v1.2 or 2) and does this all in one device. This product works and I have it but it needs to support the third computer. It only supports two. I'm in the process of migrating from an old Win10 computer to a new one, also Win10. For a period of time I plan to have both computers active to facilitate transferring files, applicatons, whatnot. I have one keyboard, mouse monitor. I'd rather not have to constantly be swapping out the cables for these peripherals.. I'm looking at a KVM switch where I can simply hook everything up. And then flip a witch so that the same keyboard, mouse, monitor will now be connected to the 2nd computer. Does the product below seem appropriate for my needs? Can you think of any stumbling blocks that I might encounter? What is the process needed to get the AWS KVM and ZEN drivers loaded in a VMWare Ubuntu 18.04 LTS System before we use the AWS migration tool to put in on an AWS Instance ? I’m specifically needing what and how to preload the drtivers etc. (the KVM is just like vCenter's console to its Windows guest clients), is this considered a risk? Access to the IP KVMs are via a couple of controlled PCs housed in a physically secure room though. I don't have the model/brand of the IP KVM currently but can enquire tomorrow. I recently purchased an Aten KVM cs84u switch and just installed two pcs. The first one is command line linux and works. The second pc is Windows 10 and behaved well for about a week. After that i installed a third one (Windows 10 also) and after the initial booting to Windows i faced the "D-SUB OUT OF RANGE 91.2 Khz /85 Hz" message. Hello Experts, to satisfy the NIST 800-171 requirement for Dual Authentication for privileged accounts we have a way to do this, but we must disable Local Policy to prevent local logons. The solution we're toying with now is using our KVM to connect remotely. Only concern if for what ever reason the KVM fails & we have disabled local logons, how would we get past this? We're running Server 2008 R2 environment. Hello Experts, I've just started a new job they currently have an Avocent DSR1021 KVM Switch in the server room. I'm drawing a blank on how to toggle between displays. I'm used to tapping "Scroll Lock" "Scroll Lock" then either up arrow / down arrow. Two pc's and one speaker system. I have a KVM switch for the monitor, keyboard and mouse and it also has audio connections. The two audio wires from the switch have the green connectors, one to each system. My speakers have another wire which is a USB power cord. The KVM solves the two green speaker wires. How to solve the need to connect the USB power cord (speaker power cord) ? What amount of power is feeding the speakers from the pc? Small current such that a Y connector could be used? Is there an automatic USB switch to allow two computers to share a USB Printer? This location has two separate networks, one for office work, and the other network is a Point of Sale system. They would like a computer from each network to share a USB printer. Is there a smart USB switch that would enable this? What video card to get ? So what video card to get? Looking for something cheap and cheerful. Which is the best slot to use? Two Full Height PCI (Optional Optical Drive) < ?? One Full Height PCIe x1 (Hard Disk Drive) < ?? One Full Height PCIe x16 (Optional Optical Drive) < ?? Our VRTx Chassis won't load the CMC right from startup. After about 5 minutes it times out and says "CMC not responding" on the little LCD screen. Once it gets to the not responding point, Pushing the power button on the chassis or any of the blade servers inside does nothing (naturally). I have scoured the internet with no luck on this issue. Since we bought this off eBay a while ago it doesn't have any support. Dell said it was a refurbished unit and they can't help me. So I'm here posting this! Another thing I tried was also from the troubleshooting doc was to recover the firmware. When connecting to the com port in the back of the vrtx chassis, It doesn't seem to want to connect to putty at all. I may have not done that part correctly but as it is, the chassis doesn't have an IP address so the com port seems to be the only way to get in if that was possible. Help is greatly appreciated at this point. Thanks in advance! how can i convert a video file on my pc to be able to watch the video on a canon camera device, the canon camert model is PowerShot SX260. I have a number of Dell R710s. I have a really annoying behaviour which is when one of them boots it is hanging. They are all connected to an ATEN KVM which I swapped thinking it was my old KVM causing the issue. The hang is clearly being caused by the USB cable from the KVM being plugged in at the time of boot. - I think I have updated all the firmware’s (e.g. DRAC, etc.). - Been through the BIOS on one of the working R710 and the hanging R710 and cannot see any obvious configuration differences. Only difference I have been able to identify is all of the working R710s have a PERC6i raid controllers and the hanging one has a H700. Has anybody seen this before or have any ideas? From everything I have read about IP KVM it seems it is basically a computer with some specialized hardware/built-in software - all blackboxed. Would I not be able to make my own IP KVM with a laptop and some special adapters and some software on the laptop? I am agnostic as to whether it would be Windows or Linux that I would accomplish this with. I am also indifferent between wired or wireless if that is a possibility. bought an Aten usb to parallel cable to connect a dot matrix printer to the desktop running windows 7. it seems like the IEEE1284 controller does not communicate properly with the printer and does not remember the settings that we have set on the printer driver settings. where can download and reintall the ieee 1284 controller driver? Qustion1: Please recommend a KVM switch using a usb cabled setup where the KB/Mouse are using a usb to connect to the switch. Question2: Please recommend a switch using a wireless setup where the KB/Mouse are wirelessly (not even sure this is a word - LOL) connected to the switch. Can this be done using windows 7 or does this need to be done on an older system? The device manual indicates that the computer needs to be running ME or XP. I have a new Windows 7 desktop that is connected to KVM switch. I have another laptop that i switch between machines using one hot key. The problem with WIndows 7 is monitor turns off after i switch to other laptop. I check the power setting and it was all high performance and to always keep display on. How do you fix this issue to keep monito ON for a while? I would like to place TV in my office and connect and see 4 or more computers in a grid, also I would like to have the ability to increase screen that I choose to full screen. I have this network cabinet that has built in cooling and ventilation where I want to keep my PCs to cool properly and to reduce noise in the room. The cabinet is in one corner of the room and I have two desks on the other two corners of the room. My goal is to be able to keep the PCs (2 desktop PCs and 1 laptop for now) in the cabinet and from there to run a CAT 5 or any other cable to extend to the two desks and only have my double monitors+ keyboard + mouse on each desk. (ab. 30ft away from the cabinet). PC1 and Laptop should go to Desk1. PC2 will go to Desk2. My question is: what kind of a KVM switches\extenders do I need to have in order to accomplish my goal? 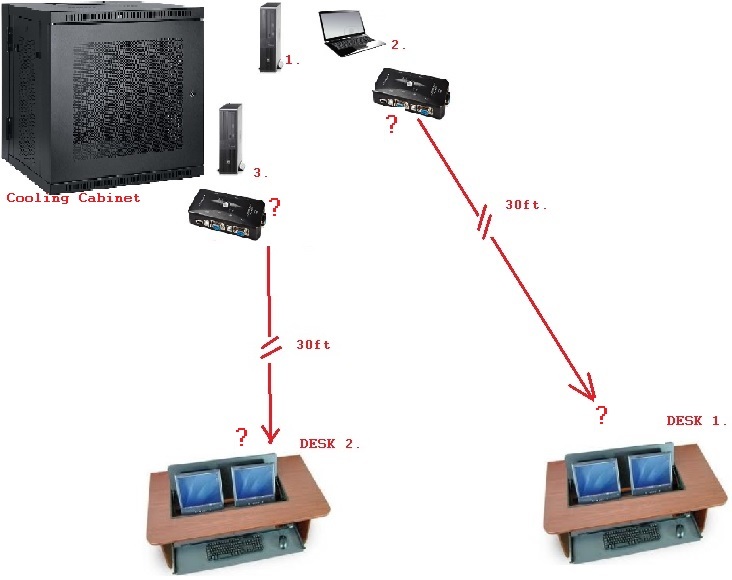 I have been researching this for some time and there are plenty of KVM\extenders via coax or Cat5 (for the extension) but I am not quite sure which product will accomplish the entire goal without compromising on any feature - to be able to use the computers from the two desks using the 2 monitors , to be able also to get the sound to the desk so I can have the speakers on the desk and not hooked up to the PCs and lastly, to be able get from the PCs the correct screen resolution over the distance (at least 1920x1080) without any loss in video quality. Please see the attached pic, hope it will help to visualize the setup. I have a job for a house of worship. They want to show content throughout the service. The set up is 2 50 flat panel TVs, 2 80'' flat panel TVs and a computer (which I must build) and monitor in the back of the room controling video content. A. What is the best build for the computer to control content on 5 screens? B. How to push the video content to the 4 big screen tvs which are the lenth of 30 yards away from the computer?